Derek on Cast Iron - Cast Iron Recipes: Article: Why Does My Cast Iron Seasoning Crack and Fall Off? Article: Why Does My Cast Iron Seasoning Crack and Fall Off? When I travel to the homes of friends and relatives, I'm always excited to see a cast iron skillet (or two, or three) in use. Nothing makes me feel at home... especially if it's well loved! When visiting folks who know of my passion (obsession?) with cast iron cookware, it's natural to get a few questions about care and maintenance. One of the issues I've seen quite a bit over the years is a good, thick seasoning on a pan that then cracks and flakes off. This has always stumped me since I've never had the issue on any of my skillets or dutch ovens... and when I ask about their care and use of the pan, everything seems to check out. They clean with hot water and plastic bristles... they dry with heat... re-oil before putting it away... and so on. I've never encountered a smoking gun on this issue. Until now! 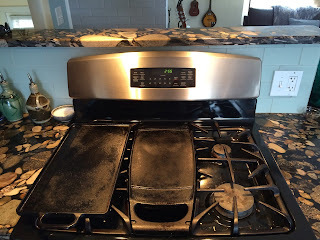 I have a gas range with a griddle that sits over the center burner (in the middle between the four main burners). Over recent months, I've begun to see this cracking-off of the seasoning. Interestingly, I have a stand-alone cast iron griddle that has some of the same problem. This led me to a theory: that an otherwise-healthy cast iron seasoning will crack and flake off if the cookware is never used for roasting. These two griddles are the only bare cast iron I own that I never use for baking or roasting... whereas my skillets and dutch ovens are ALWAYS in the oven roasting something. To try to confirm this theory, I recently asked an acquaintance who suffered from this malady... and sure enough, she never roasted with her skillet. The only oven-roasted dishes I don't put in cast iron are baked goods like pies, cookies, and muffins (which have their own shape requirements), lasagna or tuna casserole (glass works better here), and pizza. Everything else goes in a skillet, or maybe a dutch oven. ... and just about any thing else you put in your oven! Using your skillet or dutch oven to roast food at 350 degrees F or above effectively gives the pan an oven-seasoning, with a meal or side-dish as a bonus. I typically use organic canola oil when I roast or season. 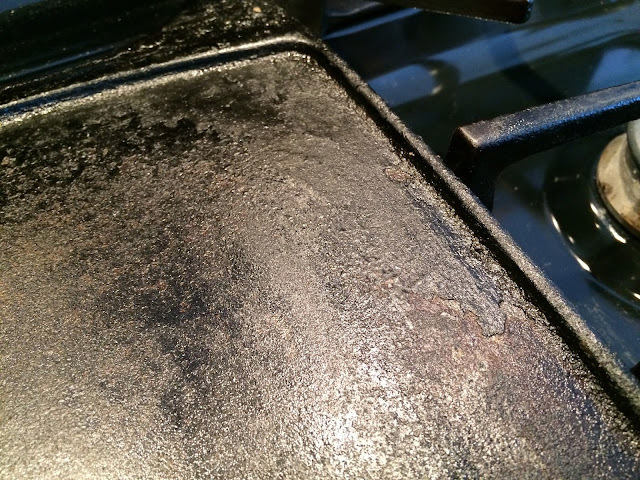 So, if you've noticed your seasoning flaking off... give your skillet a good scrape with a metal spatula, oil it down, and use it more often in the oven. I'd love to hear how it goes! Interesting! I've often wondered the same thing. Thanks for the info! I am new to cast iron, and have enjoyed learning more on your site. I am interested in getting a dutch oven. You described camp dutch ovens as having legs to provide room for the ashes under them, but your picture looks like a flat bottom. I am wondering about getting a flat bottomed cast iron dutch oven that I could use inside as well as over camp fire, but this would not have the legs or indented cover. Do you think it would work as well, or would it be better to invest in a camp dutch oven and get a separate one for inside cooking? Thanks! I would definitely recommend a camp dutch oven for campfire cooking. While you could overcome the lack of legs with rocks or a clever arrangement of wood... the true elegance of a dutch oven is being able to apply heat from above (by stacking hot coals on the lid). The lip makes this possible. You could certainly use your camp dutch oven for indoor cooking, but the legs are a pain when sliding it in and out of an oven since they tend to get hung up on the oven racks.